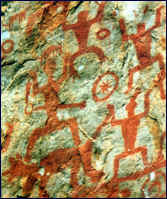 Hua-shan cave painting using iron oxide, southwestern China, ca. 4,500 BCE. The uppermost realm on the Wheel of Rebirth is that of the devata. There are four highest devas or gods of which two, Indra and Brahma, appear most often in Buddhist scriptures where Indra, ruler of the upper realm, is called Shakra (Pali: Sakka.) In the orthodox Indian view, Brahma is the Intelligence that can be compared to the deity of the western religions, but he does not have that role in Buddhism. Shiva (in Tibetan, Lha Chen) also plays an important role; in fact his god-realm is called Shambhala. In the Buddhist view, these gods and goddesses are, for the most part, considered to be highly evolved bodhisattvas. Indian mythology makes some distinction between rakshasas -- titans or the anti-gods -- and yakshas that are nature spirits, often tricksters. The former seek to usurp the powers of the gods or devas but the word rakshasa is also often translated ogre (Skt. ugra) or demon. Sometimes there seems to be no clear distinction between the two categories, and there are considered to be various types of both. ". . . the ninth century when the Tibetan king, Trisong Deutsen, invited Shantarakshita from India to teach Buddhism in Tibet. The local spirits proved hostile to this foreign religion and actively obstructed the efforts of the Indian spiritual master. Shantarakshita then advised the Tibetan king to invite Guru Padmasambhava, a tantric adept from India, to deal with these hostile spirits. Accordingly, Padmasambhava (also known as Guru Rinpoche) came to Tibet and subdued the most powerful spirits. Once vanquished, the spirits were bound by oath to act as Dharma Protectors. Thus, worldly protectors began to play a role in the Tibetan Buddhist pantheon. Vajra Sadhu (Dorje Lekpa,) a Genyen subdued by Padmasambhava. These same Eight Groups -- the Hachi Bushu -- according to Japanese tradition. "In other traditions demons are expelled externally. But in my tradition demons are accepted with compassion." ~ Machik Labdron, patron of the Chod practice. you lack understanding and meditative insight, this test could become an obstacle. However if you have enough insight and understanding, the test could heighten your realization to a great extent. As an outcome of meditative experience, whatever appearances may arise can be transformed through meditative insight into a realization of the nature of all things as insubstantial, uncompounded, and only existing interdependently. Then we do not reject the appearances of existing things, but nevertheless none of these things hold the truth of independence or the truth of substantiality. They are just another play of illusion. If a person understands and relates in this way, whatever drama appears in meditation could be tremendously uplifting. On the other hand, when you are meditating you may get drawn into whatever arises out of your habitual and emotional conditioning. The appearance may just be your psychological patterns, but for you it is a spirit, it is demonic, and it is real. You will probably be afraid and try to defend yourself. That is not the strategy we adopt in the path of meditation, though. The lotus is the representation of the physical world, and the various classes of beings are described as living on or under or outside its petals. The 8 Classes of Spirits and Ogres found there, including yakshas [ Tib. : sadag,] nagas [lu] and rakshasas [nyen] vary only in details according to the different Tibetan Buddhist authorities. Kinds of sadag (or, sadak) according to The Collected Gems of the Elements. According to the Longdo lama Nyawang Losang's Enumeration of the Names of Oath-bound Guardian Beings (Beyer 294) there are the 1. lha who are white, 2. deu who are black, 3. tsen who are red, 4. za who are multi-coloured, 5. mu who are brown, 6. sinpo who are flesh-eaters, 7. jepo, treasure protectors and 8. mamo who bring disease. 1. gongpo 2. teurang, 3. ngayam 4. sadag 5. yulha 6. men 7. tsen 8. lhu. 1. sogdag 2. mamo 3. shinje 4. deu 5. neujin 6. mu 7. dralha 8. gongpo. Beyer found a Tara Sadhana of Anupama.rakshita's that asks protection from "evil spirits above, planets and constellations, evil spirits below, and the sadag, lu and nyen, and harm from evil spirits upon the surface of the earth, the ghosts, kings and tsen." In fact, there is not much contradiction here for in the main, the Tibetan classification follows the traditional Indian one. Read some lyrics of the Tibetan Gesar of Ling epic in which goddess Ma Nene Karmo describes the unseen realms. Take a demon as a demon and it will harm you. Know a demon is in your mind and you'll be free of it. Drala is actually a transliteration for two different Tibetan terms. Therefore it stands for two slightly different kinds of deity. One is spelled sgra bla, and the other is spelled in Tibetan, dgra lha. The first one with the element, sgra refers to a kind of energy; it is a vibrational entity. The second (dgra-) word ends in the syllable lha, and it is a kind of god. Drala spelt sGra bla begins with the syllable sgra which means sound, and continues with la that here means "a type of individual energy that is endowed with protective functions" (Norbu 1995.) For example, seng- ge'i sgra means the lion's roar. It is also possible to write and hence, refer to sgra'i lha since sGra means a sound or cry, but using lha here instead of la conveys the meaning of a sound deity. We have seen that drala spelled sGra-la (no "h" sound) refers to a spirit of sound, and it is based on ancient ideas about the unseen world and its influences. Sound is an aspect of our nature that has a kind of dual existence. Although it is invisible, it is generally perceived by our common sense of hearing, but according to Namkhai Norbu (Drung, Deu, and Bèon 1995) it is also linked to the individual's positive force or Cha (cf, Qi or Chi of transliterated Chinese) which is also the base of prosperity, and to the wang-thang (ascendancy-capacity. [bio-rhythm?] Both of these aspects are seen as related to the protective deities and entities from the moment of a person's birth. Sound is considered the foremost connection between the individual and his la [lha?.] This is the meaning of the word sgra-la." Trungpa Rinpoche (and some other lamas) refer to a drala principle and also, to the benefits of working at being open to meeting the dralas. There, the dralas are elements of reality, something like European fairies, since we can know them only when we are open in our perception and attuned to our surroundings. A few of the selections in Dharma Rain: Sources of Buddhist Environmentalism (Kaza and Kraft. Shambhala, 2000) refer to the significance of the drala idea, which seems a blend of at least two different concepts. The Biblical patriarch Jacob became known as Israel after struggling with an angel who wounded him "in the thigh." In that context, the Hebrew word for "angel" also denotes a kind of adversary. In the Tibetan context there is a similar idea, since the word dGra means adversary, opponent, or champion (in the sense of combat.) The lha at the end of the word beginning with dGra is used for ancestral spirits. It also turns up in the context of the Tibetan epic, Gesar of Ling, where according to Nebesky1956,318) the hero was called " dgra lha of Zhang Zhung." The dGra word ending in lha gives the meaning, "above the enemy" or "beyond aggression." (The personal name dgra dul or as we usually see it in Romanised format, Dodul, meaning one who vanquishes opponents.) Dralha spelled dGra-lha can also refer to a true war deity such as Zhang-Zhung Gi Dgra-Lha who is the war goddess of Shang-shung. In Tibetan culture which is not entirely monolithic or homogenous, but varies according to the region and the religious view of a family or a population, there are numerous lha of many different kinds. Phug-lha are Tibetan domestic deities that protect all family members and their goods. Accordin gto Namkhai Norbu (1995, 251) they govern the cha and yang of the home and defend them against damage. " They may be disturbed if a tantric Buddhist or Bon practitioner comes into the kitchen, as their protective deities usually belong to the class of rGyal po or bTsan, which can easily conflict with the Phug lha. Then it is necessary to perform a bSang rite to restore harmony." a Dralha, the personal protector or "enemy" god that resides on the right shoulder. a Soglha or life deity, whose seat is in the heart. a Pholha or male lineage god, in the right armpit. ~ The Dralha segment is from Okar's Review website, no longer online. Chogyam Trungpa Rinpoche once told Jeremy Haward that "although there was great development of wealth in the Western world, through a lot of manufacturing, mining of the earth and so forth, much of the vitality of the land had been harmed, and because of that the dralas had departed." ~ Shambhala Sun, March 1996.
local deities (gramiya devata) of the Himalayan region. One person's god is another's devil. In ancient Iranian mythology, the term deva or daeva is understood to refer to a demon. That is how English acquired the word devil. And the word ashura that signifies, in India, an opponent to the gods or Hindu devas, derives from the Iranian word Ahura (the s was dropped as a result of one of the characteristic transformations in the migration of vocabulary) that signifies the benevolent one of a pair of deities. A tulpa is what is called in Yiddish a golem. It is a manifestation created by an adept to accomplish a certain task or tasks. "Once the tulpa is endowed with enough vitality to be capable of playing the part of a real being, it tends to free itself from its maker's control . . . . Tibetan magicians also relate cases in which the tulpa is sent to fulfill a mission, but does not come back and pursues its peregrinations as a half-conscious, dangerously mischievous puppet. The same thing, it is said, may happen when the maker of the tulpa dies before having dissolved it." ~ Alexandra David-Neel, With Mystics and Magicians in Tibet. A rolang is like a zombie. This is a human being whose body is alive but who is neurologically and psychologically paralyzed to the degree that he or she functions like an automaton. "Wade Davis wrote a book (The Serpent and the Rainbow, 1985) in which he tried to demonstrate that Haitian zombies are people who have been poisoned first with puffer fish poison and then later with datura. They are then kept in a brain-damaged state and sometimes used as laborers. To be zombified is said to be a "fate worse than death" reserved for those who have offended community norms. offerings to Mahakala (Dorje Gonpo). If I remember correctly, the ancient Scythians in central Asia inhaled datura fumes in a ritual context. Perhaps Tibetan rolang are people who have been brain damaged by deliberate or accidental datura poisoning who revive after being in a coma. [So] Believing in zombies may not be so irrational after all. [And] It would make killing them a non-meritorious act. A friend of mine who was in Tibet two years ago said that people he knew took the existence of rolang for granted and said that the high wooden thresholds of Tibetan houses were to keep them out as they cannot bend their knees. "